Let me say here and now that I am in no way a nutritional expert! Also, in merely one post, there is no way that I can address every aspect of healthy eating. 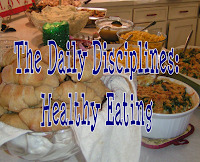 However, I will share a few guidelines that I try to follow in order to choose healthy food. These are mere suggestions based on my experiences, and many of them are common sense things that many of you probably already follow. I look forward to hearing from you about the choices you make in order to eat well with wisdom. The biggest key to healthy eating, I've found, is moderation. I eat a wide variety of food, even an occasional treat with no health benefits whatsoever, but the key is that whatever it is, to eat it with moderation. Even too much of a good thing can be a bad thing! Almost 3/4 of our body is composed of water. Thus, we need to drink a good amount of water each day in order to stay healthy. The article "How Much Water Should I Drink?" gives helpful advice on the number of glasses you should aim to drink based on different factors in your life. I have always had a hard time actually drinking the recommended amount because I feel waterlogged and don't like having to use the restroom so frequently! But, I'm trying to drink more water, for when I do, I often feel more awake and have a clearer mind. I also try to choose to drink water instead of other kinds of drinks, particularly pop. I will have juice and milk occasionally, at least for breakfast, but I have made it a goal to avoid pop (or soda or coke, or whatever you like to call it!). It's nice because at home, we simply don't keep pop around, except for special occasions such as birthdays. I really appreciate how our parents raised us not to drink it often. While at school, it can be harder, since there are always soft drinks available at every meal. At the beginning of last semester, however, I decided to simply not even ask myself whether or not I was going to have pop that day, and instead automatically get water. I've probably had pop 4-6 times since coming to college, and those usually weren't in the cafeteria. Avoiding the sugar and caffeine in the drinks has only been a good thing! I also don't drink coffee or tea simply because I don't really like the taste (or in the case of coffee, the smell). Water is good for me! My mom always had some kind of cooked or cut-up vegetables (or both) with every lunch and supper, and she always kept fresh fruit around for snacks and after-lunch "desserts." I am very grateful for this, for now I truly like fruit and vegetables, and really miss them if I can't get them with each meal. The leave me feeling fresh and invigorated. The vitamins and nutrients they contain simply can't be beat. In the cafeteria, the cooked vegetables are usually cooked in oil or steamed to the point of being limp, so it's rare that I actually find some that look appetizing. However, the salad bar is always open for lunch and supper, and it's usually pretty good, although sometimes you have to avoid the wilted leaves. So, often I end up having salad twice a day. This can be good, but I also have to make sure that I don't make my salad unhealthy by putting too much on it. I don't like salad dressing (or mayonnaise - for some reason I just don't like the taste), so I don't have to worry about adding fat with that. However, I do enjoy eating shredded cheese, cut up boiled eggs, and chow mein noodles on my salad - things that we rarely have at home with salad, but that are readily available here. Again, the key is moderation. I do have those yummy ingredients on my salad regularly, but I try to make sure that it's not every single time. Thankfully, the cafeteria almost always has a basket of apples, oranges, and bananas, and occasionally they have other fresh fruit as well. I almost always have an orange with breakfast, grab an apple as an afternoon snack, and sometimes eat a banana or another apple with lunch or supper. The apple as a snack between classes really helps give me energy and a clear mind, the boost I need in the midst of a tiring afternoon. Juice is also good, but when I can I try to have real fruit instead, since it is better for you. Yes, fresh fruit and vegetables are more expensive than prepackaged food, but I think that it is worth it. Plus, smart shopping and buying whatever is in season and on sale can help a lot in keeping costs down. I don't avoid sweets altogether, although occasionally I will try to eat less sweets as one of my weekly goals, and I just completed a 40-day fast from sweets, which was really helpful. However, enjoying something sweet is not a bad thing - in moderation! At college, I've decided to just avoid the ever-present dessert selection, since every dessert I've gotten that looked good turned out to be a disappointment because it just didn't taste as good as something homemade. The cafeteria also has ice cream available during lunch and dinner, however, in many good flavors! I try to only eat it once a week, if that, which makes it more special and enjoyable and keeps me from eating it every day! Lest I sound as though I'm extremely self-controlled when it comes to this, let me assure you that often I break my own guidelines. These are things I aim to do, but don't always accomplish. I often have too many sweets at things like receptions and parties, but I try to use restraint. I also occasionally have treats, such as shakes, when out with a sibling or friend or going out to eat with family. But again, I try to make these the exception rather than the rule. It can be fun once-in-a-while, but I don't want to make it a habit. Cooking from scratch is a great way to have control over the ingredients that you eat. I know that there are plenty of unhealthy things you can (and I do, occasionally) make from scratch, but as a whole, meals tend to be more healthy when you make them rather than popping something pre-made into the oven. It also takes more time to cook from scratch, but I think the benefit of wholesome and delicious food is well worth it! Plan ahead whenever possible, so that you leave enough time and have the right ingredients for whatever you're making. Use whole grain in recipes when possible - it's better than white flour, though sometimes a balance is needed, and whole wheat may take getting used to. Changing recipes slightly can work well to make things more healthy. For example, use applesauce in breads/muffins instead of oil, or use half of each. Cut down slightly on sugar or cheese in recipes - you usually won't even notice that much. Instead of using a whole bag of chocolate chips in a batch of cookies, use half a bag. Again, you don't really notice the difference. However, you'll have to experiment and learn each recipe by trial and error. Some truly don't work unless you follow the recipe exactly. Eating home is more healthy and cost-effective than going out to eat. Though an occasional dinner out can be a special treat for the family and helpful on trips, packing meals that you're going to be gone for will truly help in the long run. This should be a given, but I find myself eating too much when the food is just really good or I just feel like eating (out of boredom or tiredness). Taking smaller portions to begin with can help, for our eyes are often bigger than our stomach, and I almost always finish the food on my plate - even if I'm full - because I've been taught not to waste food. So, take less food than you think you need. Seconds are almost always available if you're truly hungry. However, I've found that I rarely go back for seconds - what I take usually turns out to be just fine. Also, in a cafeteria, where so much food is around all the time, I try to limit myself to one main dish (meat, a sandwich, or casserole), and 1-2 small sides, 1 or both of them fruits or vegetables. Though food tastes really good, feeling bloated because you ate too much doesn't feel that good! Accountability, again, can be a very helpful thing if you're struggling with having self control in the area of food. Having a friend or group to keep you accountable for not overeating or for avoiding certain friends is very beneficial, for if you know you'll have to tell others that you ate something, you'll think twice about eating it. However, care should be taken that you don't get too controlling in the area of food, constantly going on diets or developing an eating disorder. It saddens me to see how many young girls go on diets when they really don't need to, or starve themselves to be excessively thin. God made us each with unique and beautiful bodies, and we should enjoy the food He has given us (in moderation!) and eat to the glory of God (1 Corinthians 10:31). Each one has a different metabolism, so food some people have to avoid may be just fine for another person. You should know yourself and use wisdom in your choices of food. This is definitely not an exhaustive list, but these are a few guidelines that I try to follow in choosing to eat wisely. Of course I don't think it's bad to have some less healthy food for special occasions or fun treats. The important thing is that you make it the exception and not the rule. What are a few of the most helpful guidelines you've found to healthy eating? What is one unnecessary thing you can eliminate from your diet now to help you eat a little healthier? Something unnecessary I can eliminate... not sure, probably the amount of biscuits (I don't know what you call them in the US... cookies maybe?) they are yummy, and some cna be healthy, but that's probably not what my body needs to keep it going all day! Thanks for this post Anna! You are so blessed to be able to share your thoughts with us and inspire us all to live 'worthy of the calling we have received'! I do like tea and I recognize it isn't as healthy as water. So I try to drink both throughout my day--though I do need to learn to quite drinking so late at night to avoid trips "out of bed at 2 A.M."
Vegetables are friends of mine...for the most part. However, most fruits don't like me that much. I have an allergy to citrus, so I have to avoid things like oranges and grapefruit. When it comes to vegetables, I really like things lightly steamed. Desserts...having avoided them for six months showed me that I am not dependent on them. Now I don't feel guilty that I had an ice cream sundae yesterday =), but I still watch it. And I know I am better for it. Only rarely do we have packaged food in this household. Most of it is nasty anyway and it doesn't save on the grocery budget. IN fact, packaged foods are expensive and filled with so many preservatives it isn't funny. Mom really tries to my hormone free when she can. We buy more expensive ground meat and chicken that doesn't have additives in it. And our milk is pasturized--but not homogenized. These are ways we eat healthy....but granted, it is more costly. Wonderful points, Anna! As a young woman who has struggled with eating disorders over the years, I will say that your approach/thoughts on healthy eating are exactly what many need to hear. By focusing on what is good/healthy ideas rather than strictly saying "don't eat this or that"(as many sites/people often do) you are promoting healthy eating habits in a way that doesn't discourage or condescend, but rather encourage/enlighten. I unfortunately was exposed to many sites/individuals who merely discussed what not to eat, etc. and found that it was one of the reasons I eventually gave into anorexia years ago. I thank God every day that I am in recovery now. It is posts like this and ideas like yours that make me want to continue toward recovery and feel encouraged. Thank you for another wonderful post! Eating healthy is something I've been working on lately. Living out in the country is such a blessing, because of the ability to have a LARGE garden! I would definetly encourage those who are able to try growing and preserving their own vegetables. They are sooo good, can have a lot less unhealthy things, and can really be a cost savings. Just a thought, thanks for the interesting article. I'm with you Anna. DON'T OVEREAT! I'm a "victim" of stress-eating. And as it seems that my natural state of mind is "stressed" (long story of tragedies in my past that ended up in my having depression) So because I'm always stressed I'm ALWAYS eating. Even to the point that I no longer even feel the "bloated" feeling. But I realized a couple months ago that I was always over eating and that it was having negative effect on my body. So I've been working on that. Fresh Fruit! I LOVE fresh fruit. Especialy Berries. And Smoothies! Smoothies are AWESOME! I love smoothies. *sigh* so I'm forced to admit. Hershey's Kisses are my weakness. I'll eat (no exageration) up to 20 in a sitting. They're sooo good! See "weaknesses" above. Hershey's Kisses. I appreciate so much what you said about healthy desserts that contain oatmeal!!! LOL!!! I really struggle to eat healthfully because my body can not digest alot of the most healthy things such as whole grains and most fruits and vegetables. So I maximize what I can and am glad I can tolerate oatmeal. I have come up with a breakfast cookie recipe that works for me and my body and enjoy it daily. I also try to eat an apple a day and find that I feel much better when I do that. As you said moderation is the key! Thank you so much for your blog. I enjoy reading it so much and am always encouraged by the insight and grace the Lord shows you. You are being used by Him to encourage more than you will ever know. Thank you for choosing to be an instrument for Him to spread His word and grace! Excuse me for commenting on a post that is a few months old...I just found your blog. I agree with everything that you say - I love to cook, and find that homemade does taste a lot better than pre-made! add the condensed milk, and then whip it again. add the vanilla seeds and extract and chocolate chips if you are having them, and whip it all together. Put it in a plastic carton in the freezer and in two or three days you will have home made ice cream!